The follow-up to Westerm Spaces, this time with Michael Stearns. The intensity of the desert’s elemental power and allure are brought into focus on this collection of evocative sound paintings. Intense heat and thunder storms, craggy desert mountains, vast labyrinth-like canyons are at the center of this remarkable portrait of the American Southwest, one that the late writer Ed Abby wrote about so potently in the book Desert Solitaire from which the title was borrowed. Desert Solitaire picks up right where Western Spaces left off, but adds Michael Stearns’ own synthetic gigantism to the fiery Roach/Braheny cabal. Opening with the awesome percussive magnetic fields of “Flatlands,” the combined flair of all three sound technicians is brought to the fore: haunting pastel shades of electronics intensify a barren landscape made flesh by the cricketspeak of log drums and ticking digital chronometers. The somnambulent “Specter” is nine minutes of igneous ambience, Roach’s cooing drones bespecked with rainshowers of dewey, shimmering synthdrops. “Highnoon” suggests a confrontation of sorts, gusty electronics forming great vortices that threaten to sandblast the desert floor back into the stone age. 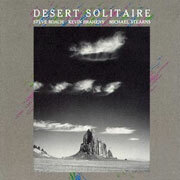 Desert Solitaire, like its title, maintains a palpable presence best experienced in a dark room frozen at sunset before a yawning chasm, the trio’s cavernous sound sculptures the only true accompaniment.